I had a date with Mickey tonight. Yay! We ate at Outback. Not our favorite place but when you have gift cards you go. We each found something we liked this time. Then we ran some errands only to find out that two of the three pharmacies we tried were closed. Huh. While at Target we decided to look around in their furniture and home dec departments. We came across a few things we just had to get for the kids' bathroom. It is in desperate need of a facelift, meaning some color. Here's the start. 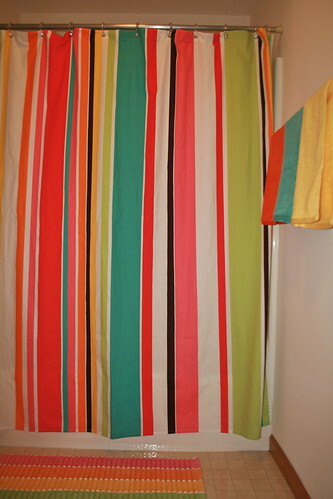 The shower curtain has great colors that appeal to all the kids. (The dark stripe is chocolate brown. It's hard to tell.) I think I'll eventually paint the walls a nice lime green. But before I can do that I'll have to remove some wallpaper in the other half of the bathroom. It's going to look awesome. Anyone want to help me take down the wallpaper? Um, I guess I will volunteer or is that a given? I love it! The colors are nice and bright. I would be happy to help you, just let me know when you want to do it. Looks Great! I think the bathroom looks fresh and much younger (facelift). Oh, I LOVE all the colors! Have you ever painted a room green before? We painted Ella and Tucker's room green when we first moved into our home and were totally shocked at how BRIGHT it was! And since then I've heard multiple people with similar stories. So, I guess this is just a warning that green on walls may be a little more than your expecting. I definitely suggest picking a shade lighter than your first instinct! But, at the same time, I love color, so I totally say go for it! Kelly, I've painted four rooms green and have loved how all of them turned out. Before buying paint I tape up the color sample I like (I know that doesn't cover a big area but it helps me) to get a feel for how that color will work in that specific room. I try it on all the walls too because each wall has different light.